This morning, after taking the dogs for a walk, it was time for work, in case we were blessed with a scorcher later! Firstly, I took the measurements required for the fillet to be inserted in the bottom of the rotten gazebo post, then before I did anything else, I went and bought ten sacks of gravel from next door, one to be used for concrete under and around the post, the other nine to top up the gravel area outside the house. I then selected the piece of timber I was going to cut the parts out for the fillet, I had decided that I would glue up an extra piece to make the timber as near as possible the correct size. 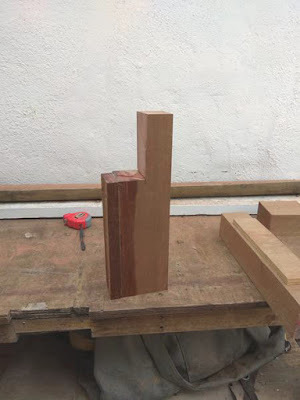 I cut the dog leg joint using the mitre saw, the table saw and the bandsaw, it's so much easier when you have the equipment! 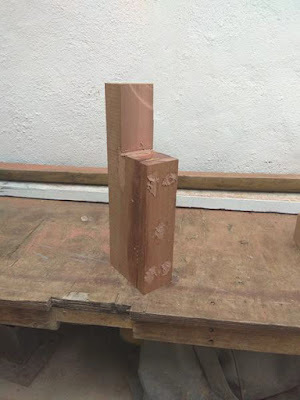 I then cut the extra inch of timber, I needed to widen the new post from 4 1/2" to 5 1/2", I predrilled the screw holes, then glued and screwed the two together. That done, unless I wanted the screws to corrode, they needed sealing, so I mixed up some glue and sawdust, using that to fill in the screw holes, and seal the screws from the elements. Now I am waiting for the glue to set, but for some reason it is taking longer than usual, so it looks as if there will be no more work today, I am not going to rush it, I want the repair to last. I have pre-drilled the upright of the dogleg joint, ready to screw and glue that to the existing post. So other than cutting the lawn with the brushcutter, that is my work completed for today.